Buy this seriously tough wallet before its gone. These genuine crocodile wallets are a real style statement. This one’s a rugged tough wallet made from the highly textured flank of this massive beast. You’ll never get bored of looking at the scales and bumps on this wallet. THESE WALLETS ARE THE GREATEST FIND ON THE INTERNET OR ANY STORE UNLESS YOU GO RIGHT TO THAILAND YOUR SELF!! 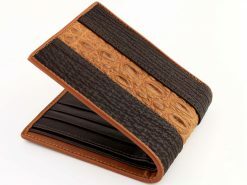 FREE SHIPPING WORLD WIDE AND TOP QUALITY- SO FAR I HAVE BOUCH 3 CROCODILE WALLETS AND 2 SHARK SKIN WALLETS – THEY ARE ALL AMAZING!! BUY HERE AND YOU WONT BE DISAPOINTED!!! Just want to say the biggest Thankyou in the world!! The wallet arrived so quick! Is absolutely gorgeous, my dad is going to be thrilled. An now going to look for a belt, will Definitely be ordering again, your service is amazing! Thankyou so much, Tracey Curtis.